Made for the typical Dutch rainy weather conditions: trendy tulip boots. Dry feet during hikes or while gardening. Available for both kids and adults. 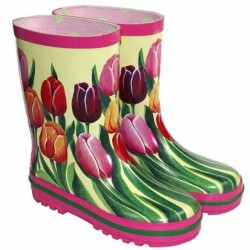 These Tulip Boots are made from elastic natural rubber and decorated with a trendy tulip design. ﻿Keep you feet dry with these trendy boots during e.g. hikes or while gardening. Available for both kids and adults (shoe sizes EU 23-39﻿).